Originally published on June 24 under the title "Holding the Balance of Power: Turkey's Complicating Relationship with Europe during the First World War and Since." A Turkish regime exploiting an international crisis to manipulate Europeans. Sound familiar? It is a historical irony that, for the second time in a century, Turkey is exploiting a major international crisis to manipulate the most powerful European nation into a hugely misconceived and self-defeating policy. Having exacerbated the Syrian civil war by allowing jihadists of all hues to cross Turkish territory to fight his friend-turned-nemesis Bashar al-Assad, then spurred a massive humanitarian crisis by allowing hundreds of thousands of Syrian refuges (and assorted Middle Eastern migrants camped in Turkey) to infiltrate Europe illegally, President Recep Tayyip Erdoğan capitalized on Chancellor Merkel's recoil from her "open door" migration policy to extract substantial financial and political concessions from the European Union that, if fully implemented, will irreversibly change the EU's demographic and cultural identity. Ottoman culpability for the outbreak of the First World War was of course infinitely smaller, yet the ailing Muslim empire was equally adroit in harnessing German vulnerabilities and anxieties to its advantage. 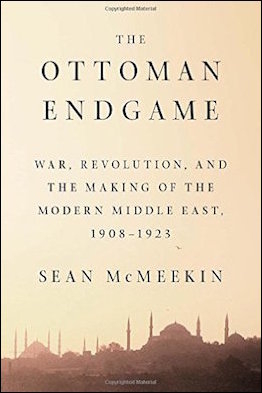 In The Ottoman Endgame, Sean McMeekin lays bare the full extent of Istanbul's manipulation and deceit, beginning with its success in goading Berlin into a secret defence alliance unpalatable to most German decision-makers, including the Chancellor, the Foreign Minister, the Ambassador to Istanbul, and numerous senior officers who considered the Ottoman army a "problem child." Sean McMeekin, The Ottoman Endgame. 550 pp. Allen Lane. £30, 9-781846-147050. He shows, for example, how the Ottoman Minister of War, Enver Pasha, clinched the alliance treaty by promising to turn over to Germany the soon-to-be-delivered UK-built Ottoman flagship, knowing full well that the vessel had been requisitioned by London; and how, immediately after signing the agreement, the Ottomans extracted a string of far-reaching concessions, left out of the preceding negotiations lest they prevent the treaty's conclusion, by allowing two German warships into the Dardanelles (in contravention of the 1841 London Convention stipulating the closure of the straits to military vessels), only to have them incorporated into the Ottoman navy so as to comply with Istanbul's declaration of neutrality - made in flagrant violation of the nascent alliance treaty. Indeed, in order to get their ally to comply with its contractual obligation to join the war, the Germans had to pour vast quantities of weapons and money into the bottomless Ottoman pit and had to endure months of insinuated threats of defection before the Sultan declared war on the Anglo-French-Russian Triple Entente on November 10, 1914. Nor was the objective balance of power between the two allies reflected in the actual relationship between them throughout the war. 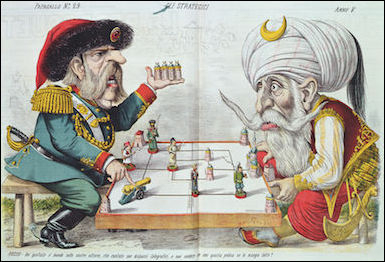 Quite the reverse; in line with their long-established practice of using their perennial weakness as a lever for winning concessions from powerful allies, the Ottomans exploited their First World War setbacks to attract ever-growing military, economic, and political support from Berlin for paltry returns. The Ottomans exploited their wartime setbacks to attract greater military and economic support from Berlin. Thus, for example, in the late-war negotiations on the renewal of the bilateral alliance, Istanbul secured the reiteration and expansion of the original German pledges as well as a commitment both to avoid a separate peace treaty and to accord the Ottoman Empire vast territorial gains in Thrace, Macedonia, and Transcaucasia. Similarly, in the summer of 1917, when Enver set out to establish a special 120,000-strong new army, code-named Yilderim ("Thunderbolt"), the Germans agreed to assign to it thousands of troops despite their great reluctance to divert any forces from the main theatre of war in Europe. Last but not least, the Germans so resented the Ottoman foray into Transcaucasia following Russia's departure from the war in the wake of the October 1917 Revolution that they threatened to withdraw all their officers from the Ottoman Empire were it to march on the Azeri capital of Baku, and planned to resist such a move "with all available means," including sabotaging the railways used to supply the Turkish army. These attempts at influence, however, came to naught as Istanbul considered Transcaucasia the natural preserve for its imperial ambitions, going so far as to order its forces to engage in battle any German units that stood in their way. McMeekin's meticulous documentation of this pushing and shoving goes a considerable way to discrediting the conventional paradigm of Ottoman victimhood. Yet he seems reluctant to follow his factual findings to their logical conclusion. "The decision by Turkish statesmen to enter the war in 1914 is best understood as a last gasp effort to stave off decline and partition by harnessing German might against the more dangerous powers with designs on Ottoman territory - Russia, Britain, and France (in roughly that order)", he writes. "Given the security problems facing the empire in 1914, there was no realistic scenario in which it could have endured indefinitely on some kind of status quo ante, only bad and worse options." Istanbul's plunge into World War I was a straightforward attempt to revive imperial glory and regain lost territories. This conclusion is hardly supported by the historical facts (or, indeed, by The Ottoman Endgame's narrative). Far from a desperate bid to stave off partition by the European powers (merely a year before the outbreak of the First World War, Britain and Russia prevented the destruction of the Ottoman Empire by its former Balkan subjects), Istanbul's plunge into the whirlpool was a straightforward attempt to revive imperial glory and regain lost territories. Had the Ottomans stayed out of the conflict, as begged by the Triple Entente, they would have readily weathered the storm and the region's future development might well have taken a different course. No empire can of course endure indefinitely and the Ottoman Empire was no exception to this rule. Yet, having lost its European colonies well before the First World War, it faced no intrinsic threat to its continued existence for the simple reason that its mostly Muslim Arabic-speaking Afro-Asian subject population was almost totally impervious to the national idea - the ultimate foe of empires in modern times and the force that had driven the Ottomans out of Europe. Even more far-fetched is the author's speculation that in the event of a German victory "a semi-victorious Britain (whatever this creative euphemism means) may still have picked off Ottoman Palestine, Mesopotamia, and Syria in exchange for accepting the German position in Russia and Ukraine." For one thing, there is no reason to assume that a victorious Germany would have shown greater magnanimity to a defeated Britain (or France) than that accorded to it by the two powers. For another, having shown no interest in colonizing the Ottoman Empire before the world conflict, Britain remained wedded to its continued existence for months after Istanbul's entry into the war, leaving it to a local Meccan potentate - Sharif Hussein ibn Ali of the Hashemite family - to push the idea of its destruction. 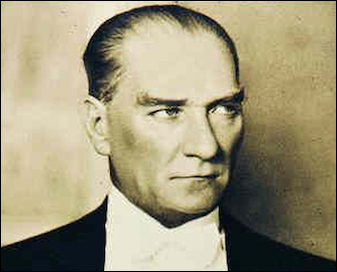 Mustafa Kemal Atatürk extricated Turkey from its imperial past reestablished it as a modern, largely secularist nation-state. In his concluding comments, McMeekin rightly deems Mustafa Kemal Atatürk's extrication of Turkey from its imperial past and its reestablishment as a modern, largely secularist nation-state to have been a resounding success. What he fails to note, however, is that for quite some time this legacy has been under sustained assault. In the thirteen eventful years since it first came to power in November 2002, Erdoğan's Islamist Justice and Development Party (Adalet ve Kalkınma Partisi, AKP) has largely undone Atatürk's secularist reforms; transformed Turkey's legal system; suppressed the independent media; sterilized the political and military systems; and embarked on an aggressive foreign policy blending anti-Western rhetoric with Neo-Ottoman ambition to "reintegrate the Balkan region, Middle East and Caucasus... together with Turkey as the centre of world politics in the future" (in the words of Foreign-Minister-turned-Prime-Minister Ahmet Davutoğlu). Islam is Europe's indigenous religion, and it will continue to be so... I kiss the foreheads of my brothers who carried the tekbir [i.e., the call Allahu Akbar] to Zurich... How holy those people were, who came and sowed the seeds here, which will, with Allah's help, continue to grow into a huge tree of justice in the centre of Europe. No one will be able to stop this... We will enter the EU with our language, our traditions, and our religion... Would we ever sacrifice one iota of that culture? With Allah's grace, we will never bow our heads.